Gloriosa Lilies (the genus Gloriosa), also known as Flame Lilies and Glory Lilies, thrive in fertile, well-drained soil in full to partial sun. Hardy in USDA plant hardiness zones 10 and 11, they can be overwintered successfully in zone 9 with winter mulch. In cooler areas, Gloriosa Lilies can be grown successfully during the summer and lifted and stored for the winter. These exotic-looking lilies produce an abundance of yellow and red flowers with petals that curl backward to resemble a flash of brilliant flames. They can reach heights of 8 feet (2.4 m) and require a trellis or wall to climb. 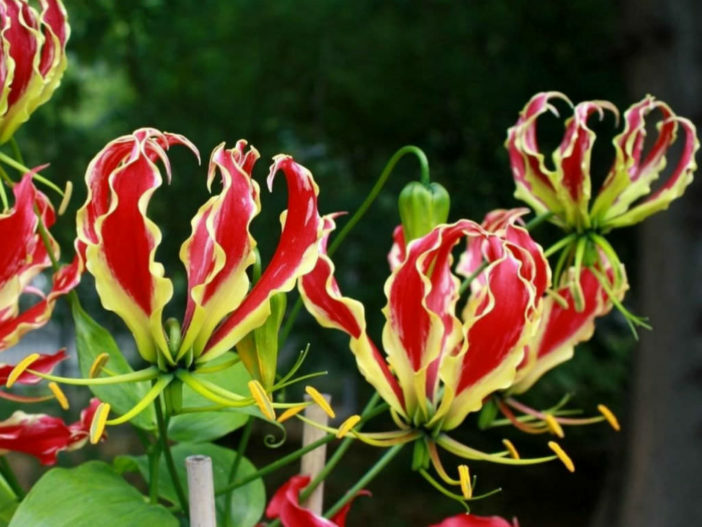 Although climbing lilies do not produce tendrils, the specialized leaves of the Gloriosa Lily cling to the trellis or other plant material, to pull the vine upward. Select a location that receives six to eight hours of direct sunlight a day. In southern climates, a location that allows the vines to grow in full sun while the roots of the plant remain shaded is the best location for growing a Gloriosa Lily plant. Some protection from afternoon sun may be needed as well. Prepare the soil by tilling to a depth of 8 inches (20 cm) and amending with generous amounts of organic matter such as peat moss, compost or well-rotted manure. Organic matter improves both drainage and aeration and provides a slow-release fertilizer to your Gloriosa Lilies. Erect a 6-to 8-foot (1.8 to 2.4 m) trellis for your Gloriosa Lilies prior to planting. Check that it is secure and will not topple under the weight of the growing Gloriosa Lilies. The ideal time for Gloriosa Lily planting is in the spring after the soil has warmed and all danger of frost has passed. Plant the Gloriosa Lily tubers approximately 3 to 4 inches (7.5 to 10 cm) from the trellis. Dig a hole to the depth of 2 to 4 inches (5 to 10 cm) and lay the tuber on its side in the hole. Space the tubers 6 to 8 inches (15 to 20 cm) apart to allow room for the mature plants to grow. Cover the tubers and gently firm the soil down to remove air pockets and secure the tubers. Water the newly planted tuber to saturate the soil to a depth of 2 to 3 inches (5 to 7.5 cm) to give your Gloriosa Lily a good start. Keep the soil evenly moist until shoots appear in two to three weeks. Reduce water to once or twice a week or whenever the soil feels dry an inch below the surface. Gloriosa Lilies typically require an inch of rain and week and need supplemental watering during dry periods. Train the vines to climb the trellis by tying them to the trellis with soft plant ties, if necessary. Although Gloriosa Lilies cling to the trellis once established, they may need some help from you to get them started. Fertilize Gloriosa Lilies every two weeks with water-soluble fertilizer designed for flowering plants. This provides the nutrients needed to promote healthy blooming. Cut the vines back in the fall after they are killed by the frost. Tubers can be lifted and stored in moist peat moss in a cool, dark place for the winter and replanted in the spring.